The Sarge cops a bullet! Seven Network sports reporter Johanna Griggs is to co-host a one hour live-to-air special, Missing Pieces, billed as ‘Australia’s first interactive TV program’. 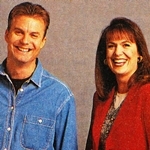 To be co-hosted by Rob Guest (Man O Man), Missing Pieces will invite viewers to call in with challenges and clues to help solve some of life’s mysteries. The Seven Network has the option to extend Missing Pieces into a series. Actress Denise Roberts, one of the original cast members of ABC‘s GP, is quitting the series. Roberts, who plays receptionist Julie Winters, will finish working on the show in October. “She feels she has gone as far as she can with her character,” an ABC spokesperson told TV Week. “She’s been there since day one and feels it’s time to move on.” Despite leaving GP, Roberts is still connected to ABC as associate producer and co-creator of its new drama series Correlli. The new 10-part series, starring Deborra-Lee Furness and newcomer Hugh Jackman, is now filming in Melbourne. As well as working behind the scenes, Roberts does make a guest appearance in Correlli as a security guard. The Nine Network has announced plans to revive This Is Your Life with host Mike Munro. The announcement may have come at the wrong time for TIYL‘s former host Mike Willesee (he hosted an earlier version of the program in the 1970s), who was planning to pitch reviving the format to the Seven Network. Former Home And Away star Matt Doran is returning to the popular soap, but viewers may barely recognise him as his character, Damian Roberts, returns from university with his hair all in dreadlocks. The Ten Network will be hoping that signing up Melissa Tkautz (E Street) and Kate Fischer to Echo Point may trigger some ratings relief for the ailing soap. Meanwhile, former Home And Away star Nicola Quilter has been doing voice-over work for the show. Jade Gatt and Ryan Lappin (pictured) have been announced as the hosts of Network Ten‘s new breakfast show, Cheez TV. 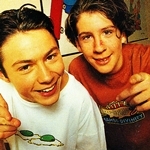 Gatt recently had a role in the movie Billie’s Holiday and Lappin has a guest appearance coming up in Heartbreak High. Aaron Pedersen, who has been replaced by Mike Hammond in the second series of Gladiators, is now doing voice-over work for a 26-part animated series, Croc-adoo. Former model Emma Harrison has joined Neighbours as Johanna Hartman, the sister of Annalise (Kimberley Davies). Harrison has previously had small roles in Time Trax and Mission: Impossible and in the film Street Fighter. Saturday: The Women’s National Basketball League (5pm, ABC) features Sydney Flames versus Perth Breakers. Beyond 2000 (5.30pm, Ten) takes a ride in a giant-sized lobster; and takes a look at the latest innovations in sports shoes. Sunday: AFL Sunday (1pm, Seven) includes Brisbane Bears versus Collingwood, live from Brisbane, followed by West Coast Eagles versus Footscray, live from Perth. Sunday night movies are Malice (Seven), Almost An Angel (Nine) and Cape Fear (Ten). Monday: David Reyne and Tracy Grimshaw (pictured) host the debut of the new-look Midday (12pm, Nine). In Home And Away (7pm, Seven), Angel (Melissa George) is accidentally launched into a modelling career. In Healthy Wealthy And Wise (7.30pm, Ten), Iain Hewitson is cooking beef at Janet Holmes a Court‘s vineyard in Western Australia, and Jim Brown discovers that penfriend relationships nowadays don’t just rely on pen and paper. Tuesday: In Neighbours (6.30pm, Ten), Mal (Benjie McNair) and Danni (Eliza Szonert) look for a boarder to help with the rent. In GP (8.30pm, ABC), Vesna (Lenka Kripac) is unable to cope with the pressures of adult life after leaving school. In Blue Heelers (8.30pm, Seven), relationships begin to fray after unauthorised firearms are discovered at Wayne’s (Grant Bowler) house and a quantity of speed found at Tom’s (John Wood) place. Wednesday: In Home And Away (7pm, Seven), Shannon (Isla Fisher) tells Pippa (Debra Lawrance) and Michael (Dennis Coard) that she is leaving. Jane Hall (pictured) hosts a new series of Weddings (7.30pm, Nine), going behind the scenes at the average and not-so-average wedding. The conclusion to Celluloid Heroes (8.30pm, ABC) looks at the history of Australian cinema between 1948 and 1971, and then to the present day. In Halifax fp: Lies Of The Mind (8.30pm, Nine), a beautiful heiress, destined to inherit $80 million on her father’s death, is suspected of committing his brutal murder. However, the young woman claims to have numerous personalities, any of whom could be responsible for the killing. Thursday: Andrew Denton guest stars in the series final of game show Vidiot (5.30pm, ABC). In Neighbours (6.30pm, Ten), Lou (Tom Oliver) and Cheryl (Caroline Gillmer) have a difference of opinion about the new direction for Chez Chez. In the series final of Police Rescue (8.30pm, ABC), Mickey (Gary Sweet) wounds a dangerous criminal during a violent rescue. Rob Guest and Johanna Griggs host the special Missing Pieces (8.30pm, Seven), covering a variety of human interest stories and inviting viewers to call in with clues to help solve various mysteries. Friday: In Home And Away (7pm, Seven), Angel (Melissa George) tries out for a modelling job which pays $10,000. Friday Night Football (8.30pm, Seven) features Adelaide Crows versus North Melbourne, live from Adelaide.